MYTH: Laser surgery cannot be used to correct a plus. A: Depending on the eye curvature, laser surgery can be used to correct a plus of up to 4 dioptres. If the adjustment makes the cornea thinner and flatter, then in the case of a plus, it is made more curved. With today's technology, a plus can be adjusted with the femtoLASIK method. 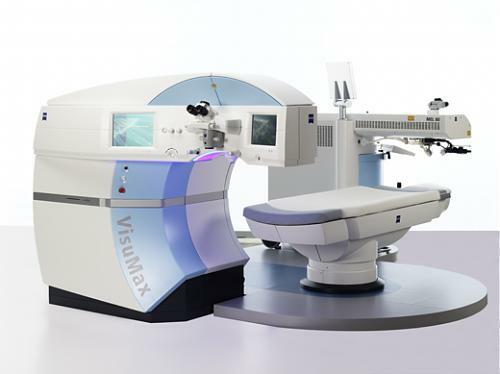 The VisuMax femtosecond laser system makes it possible for the surgeon to create a precise corneal flap during refractive vision correction surgery. In combination with the MEL 80 excimer laser, the VisuMax technology offers outstanding clinical results and greater comfort for patients. A significant feature of the VisuMax is that it uses a curved contact interface that attaches to the cornea during the treatment. The cornea is only slightly flattened, which prevents unnecessarily high intraocular pressure and stress to your eyes. This provides maximum comfort and allows you to see throughout the entire procedure, unlike with microkeratomes or other femtosecond lasers, where your vision is "blacked out" for awhile and patients have reported feeling uncomfortable pressure. If you have been told that you are not a candidate for LASIK because you have thin corneas, the accuracy and predictability of VisuMax may make a difference in your situation.